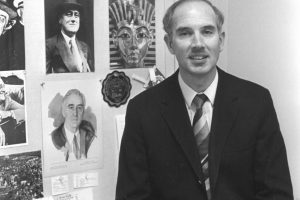 Tom Williams, Edwin A. Morris Professor of Physics Emeritus, dies at 77 He taught at W&L from 1974 to 2011. Tom Williams, Edwin A. Morris Professor of Physics Emeritus. Harry Thomas “Tom” Williams Jr., Edwin A. Morris Professor of Physics Emeritus at Washington and Lee University, died Feb. 1, 2019. He was 77. Williams joined the W&L faculty in 1974 and retired from W&L in 2011, after nearly 40 years of teaching. He attended the University of Virginia, earning a B.S. in physics in 1963 and his Ph.D. in physics in 1967. He did a two-year postdoc at the National Bureau of Standards and another postdoc at the Universität Erlangen-Nürnberg in Germany. He had a one-term teaching appointment at the Virginia Military Institute and was a staff scientist at Kaman Sciences, studying electromagnetic shielding, field propagation, transmission and reception. Williams always taught an intro to physics class: “It’s important for me to do that,” he said. His favorite class was quantum mechanics, because “that is the last class physics majors take and the one they are least likely to understand. It’s tough to sell a bill of goods that no one understands.” His research interests included quantum information theory and non-equilibrium statistical mechanics involving both analytical approaches and computer simulations to address system behavior in one and more dimensions. Williams twice served as head of the Physics Department, as well as associate dean of the College from 1986-89, as acting dean from 2002-03, and as provost from 2003-07 before returning to teaching. During his time in Washington Hall, Williams oversaw the now thriving Campus Kitchen project, as well as the Science, Society and the Arts conference. He also helped secure the $33 million Lenfest endowment to supplement faculty salaries. Williams was a member of the Fortnightly Club in Lexington, a group that gathered monthly to present and discuss thought-provoking research projects, current events and personal stories. One of his presentations covered the history of the oyster industry at Deep Creek. He volunteered for Meals for Shut-Ins for many years and enjoyed visiting the homebound and sharing their stories. Williams created an emergency supply kit to ensure their basic needs were covered during inclement weather. Williams is survived by his wife of nearly 44 years, Lynn; his daughter Ann Merkel and her husband, Bob, of Winston-Salem, North Carolina; his son Scott Williams and his wife, Sharon Vandivere, of Takoma Park, Maryland; his daughter Christine Riley and her husband, Jeff, of Charlottesville, Virginia; his daughter Janice Weatherly and her husband, Richard, of Burlington, North Carolina; his daughter Leigh Baker of Moneta, Virginia; and his grandchildren Will and Ben Riley, Elise and Annie Weatherly, Samuel and Abigail Baker, Grace Williams, Isaac Merkel, and Dearndre and Laneisha Scriber. A memorial service will be held Friday, Feb. 8 at Kendal in the Anderson Center at 2 p.m. In lieu of flowers, the family requests that donations be made to Meals for Shut-Ins, P.O. Box 581, Lexington, VA 24450.